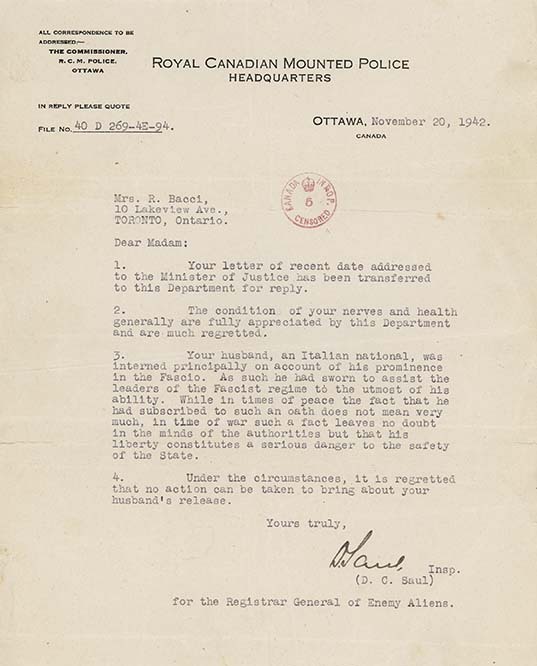 Letter from D.C. Saul, RCMP Inspector for the Registrar General of Enemy Aliens, to Mrs. R. Bacci, November 20, 1942. In the letter, the RCMP provides an explanation to the wife of internee Ruggero Bacci regarding his internment. The reason for his arrest and detainment centre on his involvement with the Fascio Umberto Principe. The letter highlights some of the frustrations and confusion faced by the families and internees. They could not understand why certain men had been arrested and interned. Membership in organizations like the fascio, the Italian War Veterans Association, and the Order Sons of Italy were often the cause. Yet, these organizations had operated for years. The fascios themselves were only declared illegal in June 1940. Also, the letter indicates the inaction on the part of the government with respect to the situation faced by the families left behind. Although the writer expresses regret for the impact on Mrs. Bacci's nerves and health, little or no real assistance was provided to her or other wives of internees. Instead, Erminia (Minnie) suffered a serious nervous breakdown and was hospitalized at length. The oldest son Aldo was forced to quit high school to help support the family. When his father was released and returned home, Aldo received notice that he was conscripted into the Canadian Army; however, he did not serve overseas.